He was charged for causing death by reckless or dangerous driving at the Bukit Mertajam Magistrate's Court earlier today, 11 February. theSun reported that the former hairdresser was charged for reckless driving today, which caused the death of his friend Moey Yun Peng on 20 January. He is being charged under Section 41(1) of the Road Transport Act 1987 for causing death by reckless or dangerous driving. If he is found guilty, he faces a maximum fine of RM20,000 and a 10-year jail sentence for his actions. Vaitheswaran's charge was read out to him in Tamil at the Bukit Mertajam Magistrate's Court today before he made the plea. Vaitheswaran on his way to the Bukit Mertajam Magistrate Court today, 11 February. Sin Chew Daily reported that lawyer S. Parameswaran argued for a lower bail of RM5,000 as Vaitheswaran's family has a low income. "His father is an electrician with a monthly income of RM2,500 while his mother is a housewife," the lawyer said, according to theSun. 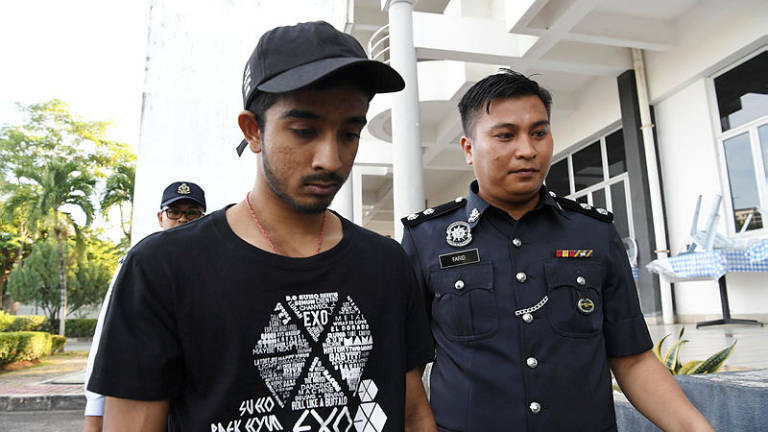 However, deputy public prosecutor Yusaini Amer Abdul Karim asked the court to impose a RM10,000 bail on Vaitheswaran due to the seriousness of the offence. Sin Chew Daily reported that he is required to present himself at the police station once a month, and his driving license has been suspended until the case is over. The case mention has been fixed for 18 March. He faces a possible two to 10-year jail sentence and a fine of between RM5,000 and RM20,000.